Benjamin Percy's Rebirth Green Arrow Vol. 3: Emerald Outlaw is a thoroughly impressive book. I had some hesitation as to how seriously or not this volume would take its subject, mainly based on the issue #17 cover that riffs, I think, on Usual Suspects but with Team Arrow looking like rejects from Rocky Horror Picture Show try-outs. 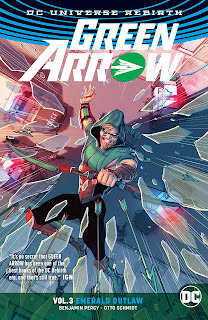 Whatever that cover's meant to be never factors into the book itself; what is here is a soundly thrilling Green Arrow story, beautifully illustrated by Otto Schmidt, Juan Ferreyra, and company, and with what so many other comics often lack -- genuine shocks. I finished this book immediately wanting to go see what the next one would be about, and then held back simply to preserve what's already been a great string of surprises. We see here the Rebirth Green Arrow creative team coalescing and coming into their own in grand fashion. The look of Green Arrow has been a revelation since the start of Rebirth, from Nate Piekos of Blambot's un-bordered word balloons to Otto Schmidt's gorgeously-angled stylized art, somewhere between Phil Hester and Darwyn Cooke. Series co-artist Juan Ferreyra has offered fine similarity to Schmidt so far, but the book has often wanted for Schmidt; here, the artists trade-off outdoing one another, with Schmidt's retro-hip figures and Ferreyra's intricate two-page spreads and watercolor-like coloring, not to mention an exuberant action sequence involving a speeding armored truck. There is nary a false visual note in this book, and furthermore the artists raise some of the book's best action sequences to near operatic levels. So sweeping is Emerald Outlaw that Benjamin Percy's got Green Arrow fighting a war on two fronts, if not more, both his enemy Cyrus Broderick siccing Malcolm Merlyn on him and Merlyn framing Green Arrow for multiple murders, and also the Vice Squad militia killing Seattle's not-so-guilty. These two stories feed into one another exceptionally well, with Arrow Oliver Queen dealing with his own internal guilt along with external threats, and trying to win the trust of the police at a time his reputation's all but shot. Within these two stories Percy introduces a bevy of new characters who populate the Seattle landscape, and in many ways the world-building of this story makes it feel like Percy's first and not third Rebirth volume. Plenty of new characters means plenty of opportunity for Percy to raise the body count, and I was floored when Merlyn's arrows started flying in the first chapter, taking out both new characters and ones we met in the last two books. Actually very few new characters survive this book, and it goes to the shock of Percy bucking expectations; my mouth hung open when Oliver's new ally Chief Westberg killed Vice Squad leader Notting to save them all, and then again when Oliver revealed his identity to Westberg only for Merlyn to kill him in the next scene. Even Percy's Trump analogue Nate Domini doesn't make it out alive when his change of heart and decision to help Oliver puts him in Broderick's crosshairs. Percy's focus on Oliver and a bevy of new characters makes for interesting reading, but it doesn't leave much room for Team Arrow. John Diggle and Henry Fyff appear almost not at all (except for Diggle's shocking last-page betrayal, another of the book's good surprises). Black Canary Dinah Lance remains just window dressing, there to bolster Green Arrow every time he's feeling low; Percy would do well to actually give Dinah a storyline in this book. I also thought Percy expected too much of the reader to bring in Malcolm Merlyn with really no recap of his recent history with Oliver; I read the end of the New 52 series but it's been a while, and Merlyn's appearance here loses some gusto when it's not clear what the stakes are.